Boasting over 430,000 attendees from 188 countries, the 2018 Salone del Mobile Milano featured distinctive designs from 1,841 exhibitors. 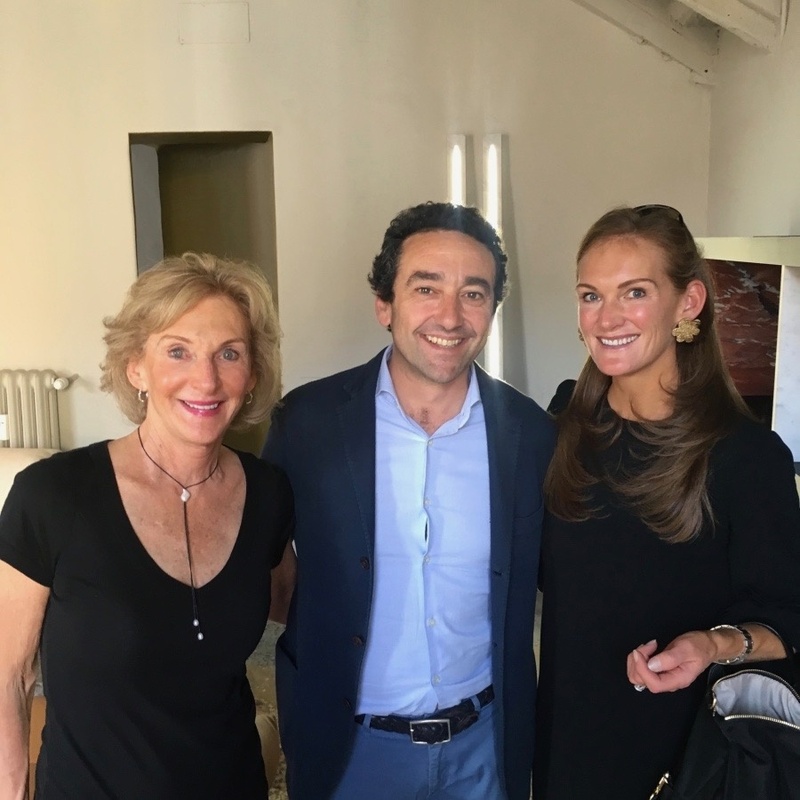 The event attracted tile designers, architects, appliance manufacturers and several other masterminds responsible for the beautiful spaces in which we live and work every day. As in past years, the overarching 2018 exhibition actually consisted of hundreds of intimate (but still expansive) events, highlighting different design elements and the role they play in our modern world. Salone del Mobile Milano is held concurrently with the International Furnishing Accessories Exhibition -- the world's top event in the decorative goods sector. In 2018, the furnishing event attracted over 200 exhibitors, each of whom showed off innovative designs at the Milan Fairgrounds. The 2018 exhibition featured a wide array of styles, spanning the best of classic and modern aesthetics. Another top attraction at the annual Salone del Mobile Milano: EuroCucina and FTK - Technology for the Kitchen. The goal? To showcase modern, upscale kitchens and the many technological advancements that make meal prep easier and more stylish. EuroCucina's latest exhibits demonstrated how the kitchens of tomorrow can be eco-friendly and technologically advanced. Highlights included built-in appliances from Samsung and voice-controlled appliances from Whirlpool. Not to mention the artistic features from La Cornue and Officine Gullo. During the International Bathroom Exhibition, visitors discovered that bathrooms no longer need be purely functional spaces; exhibitors demonstrated that new design and technological elements provide much-needed opportunities for respite in a stressful world. As with EuroCucina, exhibitors elevated familiar concepts with new takes on sophistication and sustainable design. Move over large format tile! For Sicis, in 2018, mosaics are taking over. Rediscovered mosaics look little like the diminutive tiles that line your grandmother's outdated bathroom; today, they're edgier, but also more glamorous. 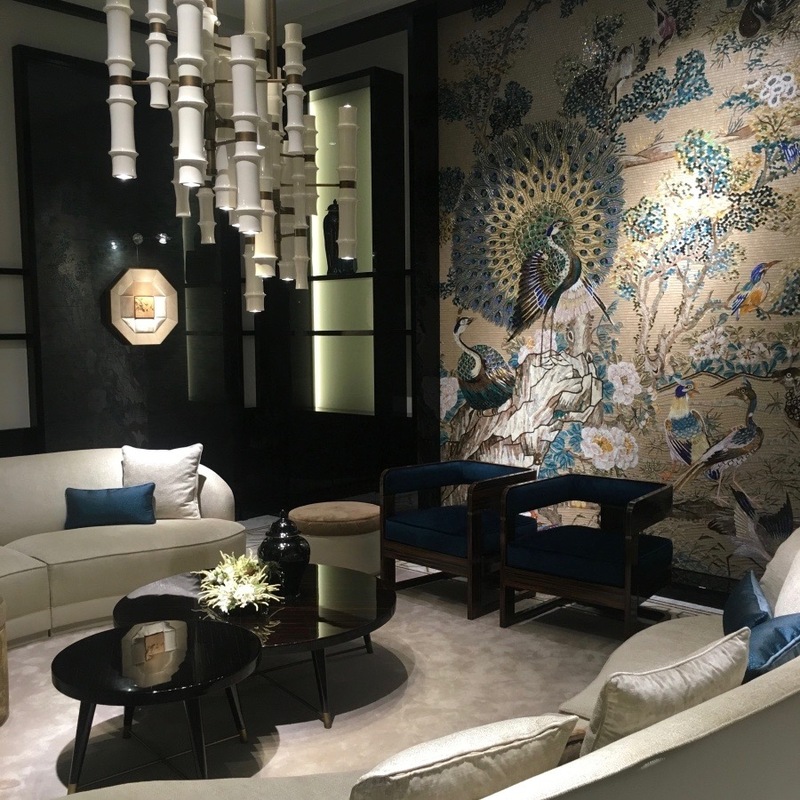 This is best evidenced by Sicis' revolutionary styles on display at Salone. Designers at Sicis sincerely believe that "the world is a mosaic." The designer's stunning creations capture the new mosaic aesthetic. Breathtaking glass mosaic tile patterns make the most of texture, iridescence and rich colors. The Sicis concept isn't limited to mosaic tiles; at Salone 2018, the designer branched out to explore furniture, textiles, hardware and more. Architect Massimiliano Raggi collaborated with the Sicis style offices to create a magnificent showcase marked by clean lines and timeless details. No detail was overlooked in the 6,000-square-foot booth. Always a hit a CERSAIE, Petra Antiqua stood out once again at Salone and the International Bathroom Exhibition. Born in the province of Vicenza, this highly talented and artistic company has long been known for its unique carved tile and exceptional craftsmanship. Every year, Petra Antiqua brings something new and breathtakingly beautiful to the tile landscape, and 2018 didn't disappoint. This year's highlight? Exquisite 24x24-inch carved stone featuring a silver leaf glaze. 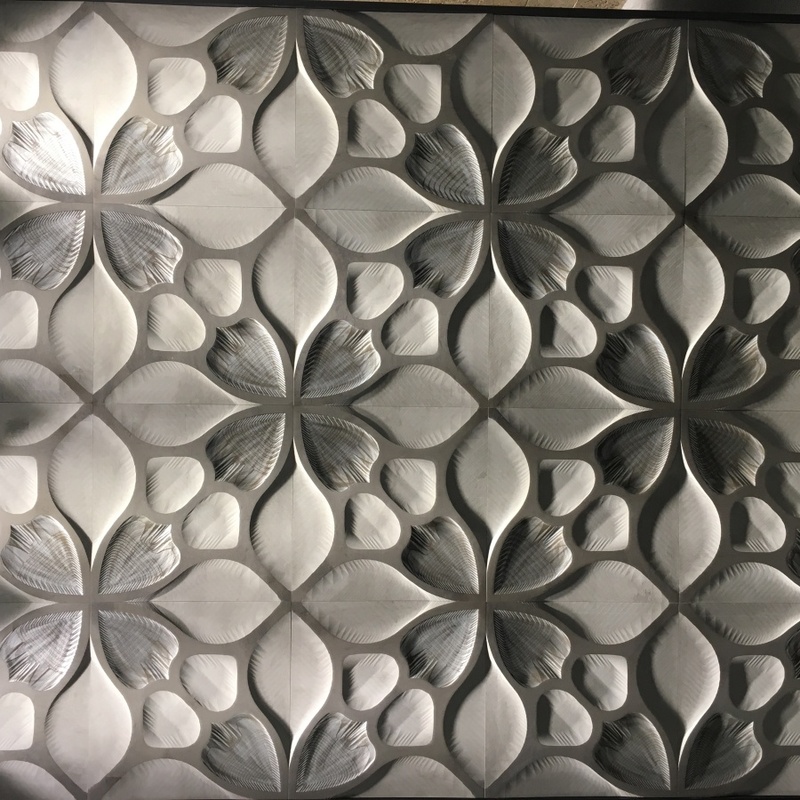 The carved pieces were carefully designed to form a botanical pattern, with every petal and leaf marked by subtle feathering. This was easily one of the best pieces we saw all week, and not one we'll soon forget. Welcome to textured stone heaven. 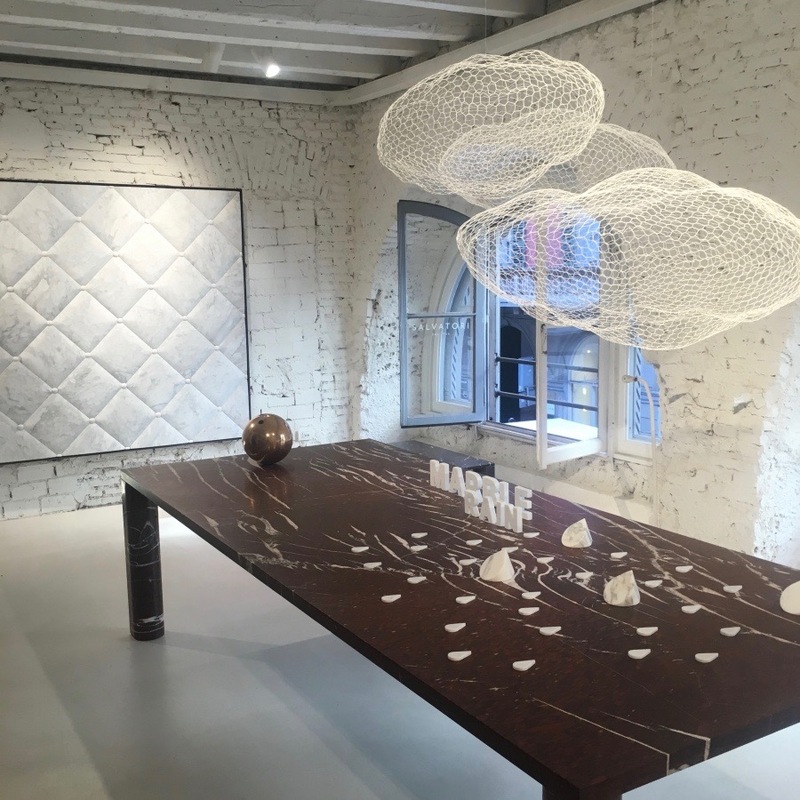 For Salone 2018, Salvatori opened the doors to display their latest collection in their lovely villa located in the heart of Milan's design district. This alone would have taken our breath away, but the real treasures occupied the villa's interior. Each room featured its own bathroom vignette, complete with a unique take on textured stone. From flooring to home accessories, Salvatori's villa exemplified why stone remains the classiest design element. Other standouts from Salvatori's Salone showcase? Simple, yet sophisticated tables from John Pawson, geometric marble compositions from Elisa Ossino, and several quirky pieces from Piero Lissoni. These and other elements integrated seamlessly to demonstrate how classic elements can play a prominent role in modern design. The designs presented at Salone del Mobileare truly a sight to behold. The exhibition's most impressive styles are bound to inspire bolder and brighter looks across the pond. If the event tells us anything, it's that innovation is alive and well in the quickly evolving world of interior design. Need help with your next tile design project? Let our team of experts help!